Learning how to use an ice axe to self arrest is a key skill that may save your life in the mountains. Don’t neglect to learn and practise it. There are many good resources to learn from including the British Mountaineering Club. Read this post. Look at the techniques discussed. Check out the other resources and then, most important of all, get out and do it over and over again on the hill until you can do it in your sleep. 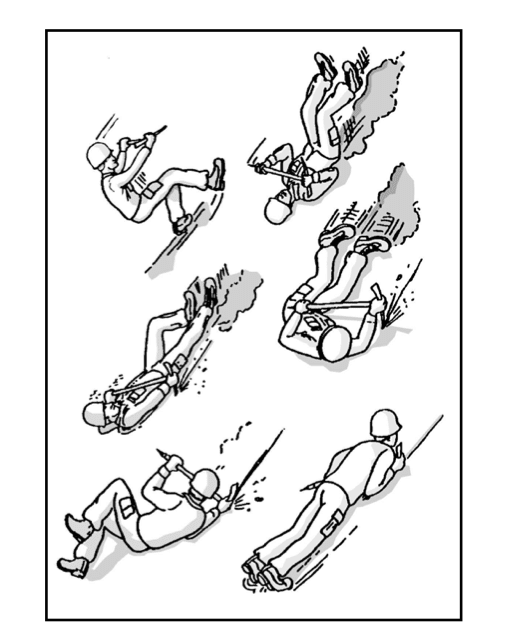 Anyhow, I recently came across an old Army field manual on mountaineering that shows how the American military teaches ice axe self arrest. I thought I’d post it here with a comparison of how civilian schools teach it as it is a nice way of teaching a beginner the basics and it also points out some differences between how Americans and Europeans train As you’d expect it is pretty similar stuff but there are important details of difference in how the self arrest technique is taught and practised. Now there are a couple of really interesting points here and also a couple of points that I’d like to take exception with. For reference I’m using the Mountain Skills Training Handbook of the Association of Mountaineering Instructors (AMI), which is probably one of the main standards of civilian training in Europe. And for reference in America I refer to the Alpine Institute, which is the leading American teaching organisation. 1 The first point to note is the grip. In this image, the climber is holding the ice-axe in the correct way with the adze pointing forwards in the direction of travel. This means it can be quickly brought up to the shoulder for use. The one difference in training is that the Mountain Skills Handbook urges climbers to bring the lower hand (in this picture the climber’s left hand – though on the right from our perspective) down to cover the spike at the bottom of the ice axe. This is to prevent it from either stabbing the climber or from digging into the snow during the roll-over. For comparison see this photo below from the Mountain Skills book. Note, the legs are up in this training picture from The Mountain Skills Training Handbook by Pete Hill and Stuart Johnston. Another big area of difference between the way that Americans and Europeans do self arrest relates to how they use their feet. In the picture at the top you will not that the climber is encourage to dig their heel in to slow themselves in preparation for the rollover (graphic 1), they then continue to dig in with one toe during the rollover and as the ice axe starts to bite and finally (3) they are positioned with both feet pointing right into the snow and digging in to slow themselves down. The British schools teach the exact opposite. I’ve grabbed a clip here from a training video produced by the British Mountaineering Council (BMC) and posted on the web to teach proper self arrest. I’m afraid that the image I have is not great but you can see that the instructor has very clearly lifted his legs up to prevent the tips of his crampons from digging in. Start at the feet, getting them to raise into the air. This is for two reasons – if crampons are being worn when a fall is made, it is imperative that the crampon points do not dig into the snow. But even if crampons are not worn, there is still a chance of the front of the boot digging into the snow. 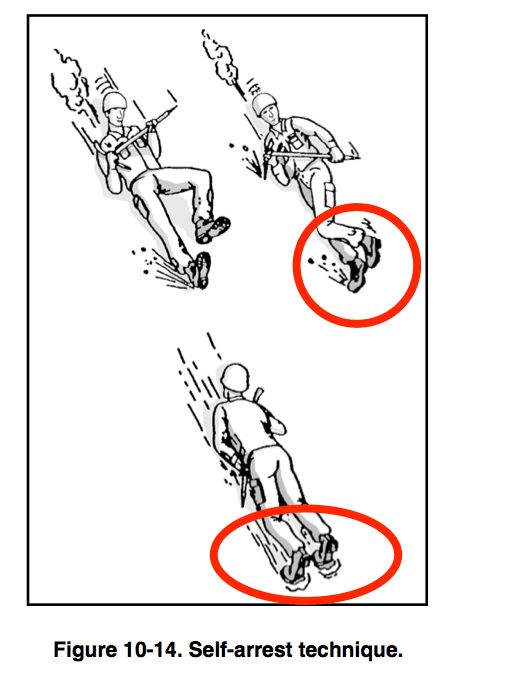 Either of these scenarios could cause injury or cart-wheeling. There is some debate on whether you should put your feet up or not. The concern — as the guide in the video points out — is that if you put your feet down and your crampon points catch, that you might flip head-over-heels. On the other hand, it might stop you more quickly. We teach people to put their toes into the snow to arrest the fall. If crampons are worn, the feet must be raised to prevent the crampons from digging into the snow or ice too quickly. This could cause the climber to tumble and also, could severely injure his ankles and legs. This sounds sensible enough except for the fact that in an emergency you behave as you’ve been trained to. If you always practise lifting your legs, then there is a good chance that when you fall and the pucker factor is high, you won’t be thinking but will do what you have trained to do. Similarly if you are used to digging your feet in, then that is what you will do. I personally recommend training by keeping your feet up. If you are not wearing crampons then hopefully you will remember to modify your position if you aren’t slowing fast enough. Frankly, though, I think that you should be focussed on putting all of your weight onto the pick and not messing about with your feet (unless you have no ice axe, in which case you’ll just have to make do and hope that hands and feet will be enough). It is important to look in the opposite direction to the axe head – if you look towards the axe head and it catches on a section of hard ice or a rock, facial injury is a real possibility. This is the more complex situation and it is best understood by practising the technique quite a few times. I’ll post the pictures from the Army Training Manual below and give some commentary on them too. In this series of pictures you see how important it is to firstly try to stabilise yourself in a fall and to then rotate the head back up towards the top of the slope. Once you’ve done that you then begin to dig right in to slow the descent. Remember not to apply too much pressure immediately as you could have the ice axe ripped out of your arms before you are in a position to hold it properly. Learning the proper ice axe self arrest technique takes a lot of practise. Spend time doing it somewhere safe and hopefully the skill will be there when you need it most. 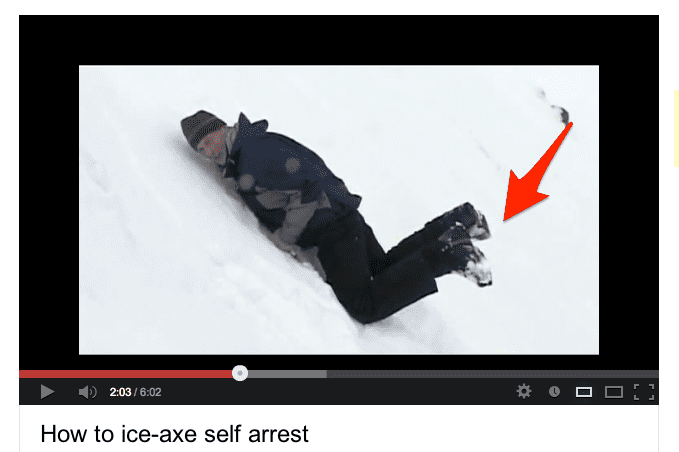 Here are a few videos showing the correct way to self-arrest from a slide using an ice axe. Proper self-arrest from a backwards position.